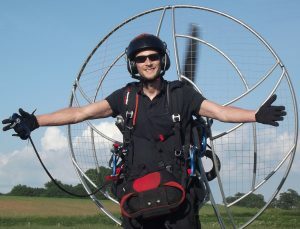 Paramotor wing collapse: What’s the chance of a collapse happening to you? If you've been searching for a paramotor app, you'll know there's a heck of a lot to choose from. Whether you simply need a weather app, or something more feature packed to track flights and list airspace, there's something here for you. I've put some to the test, and also scoured the internet to find the best paramotor apps available. Let's check out the top apps, to help you decide which one is best for you. 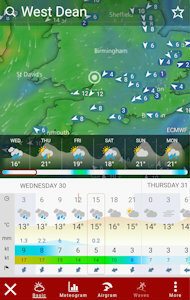 Windfinder was recommended to me by my instructor, and has been my most used weather app since. It's really easy to use, and the local wind prediction is always very accurate. Windfinder offers wind forecasts, and weather forecasts, for over 40,000 locations worldwide. There's a free version that you can use to get started, and a more feature packed paid version. 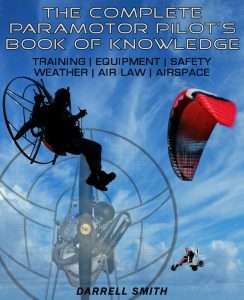 You'll want the paid version if you're serious about paramotoring, as it offers something called the superforecast. The superforecast offers an hourly weather prediction which I've found far more accurate than any other weather app. There's also real time observations from more than 20,400 weather stations worldwide. Choose a local weather station to view the current wind speed, wind direction, air temperature, air pressure, and other values in real time. 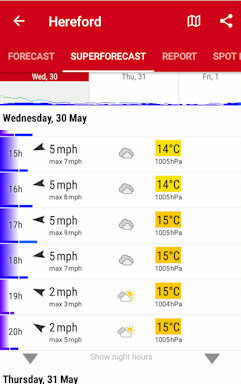 You'll find animated wind forecast maps, tide and water level forecast, and a 10 day wind forecast at a glance. There's also spot info for each of your saved locations, including sunrise and sunset times, coordinates, elevation, and more. Windy is another great paramotor weather app with lots to offer, and it's free! If you enjoy the odd bit of free flying, Windy displays forecasts for over 1500 Paragliding spots worldwide, at the click of a button. It also displays wind surfing spots, which can come in handy for a bit of beach flying. The app is a little more complicated than Windfinder, and the extra features can sometimes make it a little laggy. But considering Windy has lots more to offer, you can put up with waiting a couple of seconds for it to load. The weather forecast is very accurate and uses all leading forecast models at once, to give more accurate predictions. You can choose between 35 different weather layers, including wind, rain, temperature, and pressure. There's even a weather radar available for the USA, Hawaii, Alaska and South Korea, which is updated every 5 minutes. It's easy to find a local forecast simply by tapping the wind map on the desired location. The app will also tell you all about the location, including its altitude, sunrise, sunset, and coordinates. And if you're unsure whether to travel, you can view local webcams for a real time view of the weather. 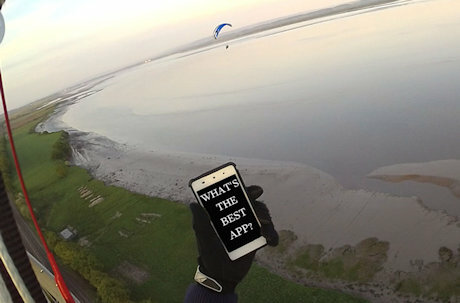 PPGPS is an app that's been built specifically for paramotorists. It's available for £3.99, or there's a free version called PPGPS lite, that lacks some of the useful features of the pro version. This dedicated paramotor app gives you real time flight information, including ground speed, altitude, fuel burn, and flight duration. It records your flights in KML format, so you can view your flight path and information in google earth after you land. You can even use it in conjunction with certain hardware, including smartwatches and variometers. The app can be used worldwide, and is really easy to use and set up for your own requirements. I find it really useful for cross country or sight seeing flights, as you can set waypoints before takeoff. You can use online maps, or download map files to your phone in case you don't have a connection during flight. It lets you map out your entire flight and set waypoints, which you can then follow throughout your flight. Another really cool feature is the live tracking, that let's people view your live flight path on the PPGPS website. Simply enable it from within the app, and your phone will automatically send your information to the PPGPS world map HERE. Some of the other handy features are the takeoff auto detect, which starts recording your flight providing the app is open. You simply set your takeoff speed threshold, and the app does the rest. This also stops it recording as soon as you drop below the specified threshold speed. The fuel gauge comes in really handy, especially during longer flights. You set the rate at which your paramotor burns fuel, and the amount currently in your tank. When you launch the app starts counting, to give a fairly good estimate of your fuel burn. There's also a low fuel warning, you can set this amount at around 2 litres, and the app will give you a heads up when you get there. This means you don't have to keep checking your watch, or using your mirror to check your fuel tank. There's loads more useful features that this paramotor app has to offer, including a super handy airspace overlay on the map. To find out more, or to get the app, check out the PPGPS website, or go here > iOS users and Android users. Flyskyhy was built with paragliding in mind, and features many useful things for free flying pilots; for example, spots where you had the most lift. 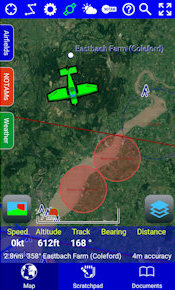 Although you may not require some of these features for paramotoring, it's still a very useful app for paramotor pilots. 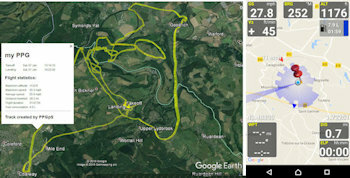 Some features are very similar to the PPGPS app, like KML file flight data recording; but there's also a bunch of other cool features to play with. Flyskyhy records all of its data to an in app logbook, so you can keep track of your flights. You can then replay the flight, or view things like your maximum altitude, flight duration, distance covered, etc. This is super handy for pilots that wish to keep track of where they've flown, and how many flights and hours they've clocked up. The airspace feature is great, but it is a paid add-on that you buy from within the app. The airspace extension covers 32 countries, and will automatically show airspace on the map view after purchase. 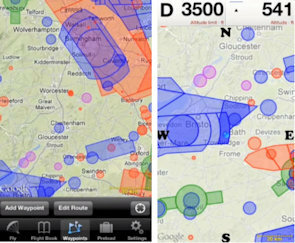 It covers all airspace classes, and you can fully customise it to your preference to avoid cluttering the map. If you fly in unfamiliar places, you'll like the airspace alarm that warns you when you're approaching or entering controlled airspace. If you like to set waypoints for cross country flights or competitions, you should bare in mind that this is also a paid add-on. You can also buy an XC extension package that you can read more about on the Flyskyhy website. There's lots of other cool little features, like a G-meter that measures your G-force using the accelerometer of the iPhone. We all love taking in-flight photos, so there's a photo button so you can take snaps without closing the app. And you can also send a link to your friend, so they can track your flight on the livetrack24 website. Just like PPGPS, this paramotor app can also be connected to external hardware via bluetooth. You'll find a list of compatible varios on the Flyskyhy website. Unfortunately, Flyskyhy isn't yet available for android, but it's a fantastic paramotor app for iPhone users. It's currently available on the app store for $8.99, with a 4.7 star rating. Find out more, or get the app here > Flyskyhy website. RunwayHD is designed for use in all forms of aviation that follow VFR regulations. The app is available for Android and iOS, and is free to download. RunwayHD has some great features, and I use it regularly for paramotoring, especially in unfamiliar locations. Something that comes in handy before every paramotor flight, is the ability to check the NOTAMS simply by opening a tab on the main screen. NOTAM information is updated regularly, and you can view all details from within the app. You can also click the NOTAM icon at the top, to highlight all NOTAMs on the map. You can then long press on the highlighted area, to get the full NOTAM details, including coordinates, date, height and description. There's also a weather report tab that gives you detailed information, known as TAF and METAR. These reports are produced by a human forecaster based on the ground, and are usually something like - clouds broken at 200ft, moderate mist probable between 00:00 and 08:00, ... and so on. You can use these when you're unsure of the conditions, and before travelling a long way to a launch site. You'll also find a rain radar for pilots in Europe, and a winds aloft forecast. Unlike PPGPS or Flyskyhy, RunwayHD comes fully loaded with airspace maps and airfield info. This means you can simply load up the app before flying somewhere unfamiliar, and check for any restrictions before launch. You can select any marked airspace to get a description, and to find out what class it is. By opening the airfields tab you can also get a list of local airfields, when you select an airfield it will then be highlighted on the map. The map will move with you as you fly, and you can even plan a route or set waypoints to follow. I've found RunwayHD very easy to use, and it always works and loads as it should without being laggy. Find out more information and get the app here > RunwayHD for Android or RunwayHD for iOS. If you need an explanation on airspace, and where we can fly paramotors you can check out this article > HERE. I've put all of these apps to the test, and have been quite impressed with their abilities. As previously mentioned, I've used some of them for years and load them up before every paramotor flight. Before writing this list, I also searched forums for recommendations and feedback from other pilots. These apps were the ones that were recommended the most, and are the ones most paramotor pilots are currently using. So I think we can all agree that these are the best paramotor apps available! Bare in mind that apps using GPS tracking can drain your battery at a rapid rate. Make sure your phone is fully charged before every flight, and take steps to save battery power. Turn down your brightness level, and turn off things that won't be needed, like WiFi and auto updates. I'll keep this list updated, and if anything better becomes available, it will be added to the list! Now you've got your paramotor app, check out some tools and essentials that you'll need in your kit bag > HERE. All all of the equipment you'll need before you can begin flying > HERE.